Huge range of football tables for sale. Indoor and outdoor foosball tables for home use. All at low prices and with free delivery! 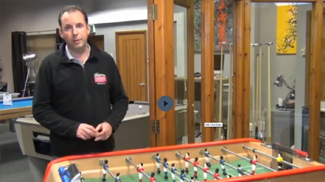 Foosball Tables have always been a common sight in pubs, social clubs and bowling alleys, but their popularity for use in the home is growing at a pace. It's a game of huge skill, which many people don't realise until you watch a top player show off his or her ability. Showing stunning ball control and manual dexterity, they can mesmerise their opponents. Hours of practice always pay off when a challenge match is on. We carry the largest range of tables available in the UK, offering great starter tables which will give you a great game, right up to professional quality collectors tables. We carefully select the models we sell, avoiding brands which are poorly made and might fall apart after just a few games. You can be sure that any table you buy from us will be of the highest quality, all backed by the manufacturer's guarantee. Whatever you need from your foosball table, we're sure to have the model to suit you. Garlando and FAS are both Italian manufacturers, they have been making table football tables for years and produce a superb range of products catering for pretty much any type of requirement. Sam tables are made in Spain, and are renowned for maunfacturing high quality commercial pool tables and air hockeys as well as football tables. Bonzini babyfoot tables, as they are called in France (where they are made) are the classic football table from the French street cafés and bars. Beautifully designed and built they make a compelling choice. If you would like some expert advice to ensure you pick the right table for your home, office, or commercial location give one of our friendly product experts a call on 0800 622 6464 and we'll be happy to help.